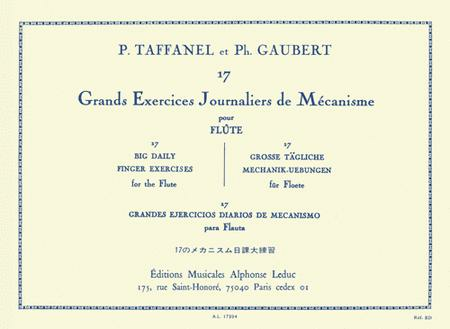 Composed by Paul Taffanel (1844-1908) and Philippe Gaubert (1879-1941), 17 Grands Exercices Journaliers de Mécanisme should be performed daily to maintain and strengthen your technique and tone. In this progressive method, the importance of the purity of the sound is highlighted and the flautist should work their techniques keeping this idea constantly in mind. A calendar appears at the beginning of the method to ensure progress is made and advice is given in four languages: French, English, German, and Spanish.